Keri beach has a backdrop of lofty casuarina trees, as opposed to the ubiquitous coconut palm found growing along the coastline of most of Goa's beaches. A long strip of sand is interrupted by jagged red rocks and headland on the south side, and the Tiracol (or Arondem) river to the north. Terekhol Fort can be seen across the river, as well as the iron works in neighbouring Maharashtra. Looking out to sea, it is sometimes possible to see dolphins jumping up out of the water, since this is by far the quietest of the north Goa beaches. Shacks on the beach are small, few and friendly with a modest clutch of sunbeds each and intermittant power shortages. Our favourite is the Dolphin Shack. If you enjoy prawns, the King Prawns sold on this beach are freshly caught, delicious and cheaper than in more touristy beaches. The charm of this quiet, modest beach lies in its slow pace, almost as if time has been magically frozen on a perfect day. Behind the beach the small, rural village is a wonderful place to explore with its green paddy fields, temples, giant banyans and exotic birds. Beautiful views of the river meeting the sea are the reward for crossing the Tiracol river and continuing to Terekhol Fort. Balmy nights when the moon's reflection sparkles in the crashing waves and glistens on the soft, wet sand. The Sunrise Cafe inland from the shore on the north side of the beach is one of my favourite places to get breakfast, always served with a wonderful smile. Exploring the rocks and headland with kites circling above. It is possible to access next beach - Paliem - (which has a sweet water lake) from here, and Arambol beach further south. 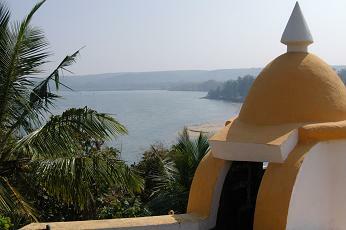 Share your favourite Goa beach with other readers on our site! Having a scooter or bike is the best way to get around Goa, and the easiest and cheapest way to reach remote places such as Keri beach. 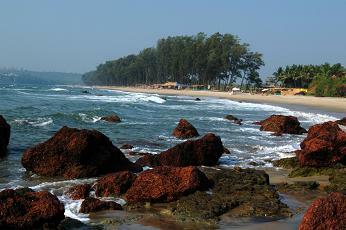 If you are on a bike, head towards Arambol and then continue past the petrol station, baring left to re-join the coast. On reaching Keri village, head left to get to the beach or continue to the ferry crossing. 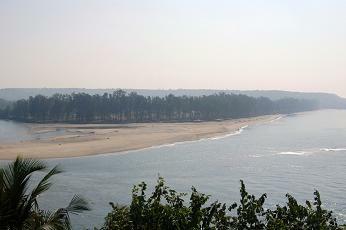 The north side of the beach, as well as Terekhol Fort across the water can be reached from here. Buses run between Mapusa and Arambol every 30 minutes or so. From Arambol the taxis/rickshaws to Keri should cost no more than a few hundred Rupees. Alternatively it is possible to walk to Keri from Arambol along the coast, though the terrain is difficult at times as you are clambering over rocky headland. Food from the shacks is usually quite basic, and possibilities are limited by frequent power shortages. Sea food is a good bet, since it is freshly caught and cheaper here than many other places. If you are staying at Keri and want a wider choice of food, you could consider visiting nearby Arambol beach where you will be spoilt for choice. When we found Keri beach for the first time, we loved it so much we decided to stay the night. We spoke to the owner of one of the shacks on the north end of the beach and stayed at his house (in rooms he lets to tourists) for a couple of nights. Ask around, especially if you are staying for a long period, about homestays, which can be very memorable parts of your trip. The beautiful Raj Star guesthouse is the only luxury accommodation in Keri (at the moment), though it comes at a modest price of R.1000 for the ensuite doubles. It is tucked behind a shop on the dirt road leading to the south end of the beach. A small number of beach huts had recently been constructed when we were there in Jan 2010, but had few guests when we returned in March that year. Further down the coast the quiet beaches of Kerala can offer visitors a chance to see Indian coastal communities that are largely unaffected by the tourist boom that brought mass development to Goan shores throughout the last decade.